Dream Theater pick new drummer, are "incredibly excited"
Dream Theater fans across the globe were stunned when drummer Mike Portnoy abruptly quit the band several months back. Well, the good news is, the group has selected his replacement. The bad news is...they're not saying who is is yet. 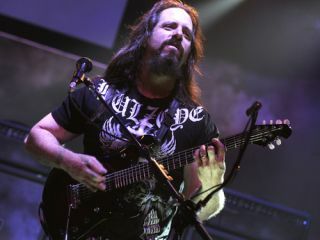 According to Blabbermouth.net, guitarist John Petrucci has updated fans with the following message: "Hey, everyone. Wanted to quickly let you all know what's been happening lately. I know that the big question is 'Who is the new Dream Theater drummer?' I also realize that some people are getting frustrated waiting for the news. "Well, auditions went great and we do have someone, but we are spending some time getting everything in order before making an official announcement. Let me just say that we are all incredibly excited about our choice and just bursting at the seams to let the world know!" Petrucci goes on to say that he's demoing songs for his next solo record as well as writing and stockpiling riffs and ideas for Dream Theater's new album - the latter of which should be soon, as the band are set to start recording in January. Despite the recent upheaval in Dream Theater's world, Petrucci has at least retained his sense of humor. In an interview on the Roadrunner Records website, when asked, "What's the biggest lesson you learned this year?" he answered, "Don't let your drummer fill in for another band" - a reference to Portoy's decision to split DT while moonlighting with Avenged Sevenfold.